One of the several communities of the Snoqualmie River Valley, yet not an incorporated city, is Fall City. There were roughly 2,000 residents in 2010. Finding a home in Fall City will only put you 26 miles from downtown Seattle, yet you will feel (and are) much closer to even better destinations like Snoqualmie Pass or the Alpine Lakes Wilderness. The Fall City community does well for no government, a community association works hard at planning community events and projects. The long established businesses are located at the junction of the Redmond-Fall City Road and the Preston-Fall City Road. Fall City boasts of great fishing, hiking, golfing, a growing artisan community, active farming and great schools. Nearby is Snoqualmie Falls, likely the source name for the town. The town is located at the confluence of the Snoqualmie River and Raging River, with the river passing one side of the downtown corridor. 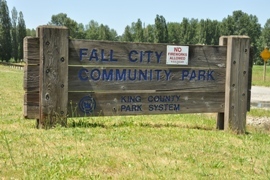 Residents of Fall City include long time farmers as well as newcomers to this bedroom community. Fall City residents attend schools from the Snoqualmie Valley School District.